When you ask an expectant mother where her baby will sleep, she has a definite answer. Granted, sometimes the answer changes once the mother goes from being an expectant mother to being a mother, but still, when it comes to where the baby will sleep, that’s something that everyone has an opinion on. The usual three plans are bed sharing or co-sleeping (having the baby right in bed with you), rooming in (having the baby in a crib, cradle, or something else in parents’ room), or having baby sleep in his own nursery from the very beginning. Everyone will have a reason for why they do what they do, and it will be a very valid reason… for that family. The reason that this is something that can stir up debate is because of recommendations from the American Pediatric Association and conflicting recommendations from Dr. Sears (essentially the father of Attachment Parenting). Well, that, and everyone seems to have an opinion on how we should parent. I am a wretchedly light sleeper. When the dogs want to go out in the middle of the night, the husband’s dog will sit down on the floor on my side of the bed and stare at me. The dog looking at me is often enough to wake me up. How likely do you think it is that I’ll be able to sleep with my kid in the same room with me? I’ve done all three of the options at least once. In the hospital, I tried having him sleep in his little bassinet… which didn’t work well. He slept with me and I got a little bit of sleep. At home, I tried having him sleep in the bassinet of the pack n play. He didn’t sleep there. I didn’t sleep with him there, either, because every time he’d twitch, sigh, or make a noise in his sleep, I’d bolt right up. We fell asleep with him in bed with us a couple of times… which didn’t help me sleep, either, because we have pillows, blankets, and puppies that are in our bed. I had to hold him to sleep, which ended up causing my arm to fall asleep… so that was a fail. Then he started sleeping in his swing upstairs, complete with the baby monitor so I’d hear him. And we both slept. It was beautiful, blissful, and wonderful. We finally made the transition to getting him to sleep in his crib when he was about four weeks old. By the time he was two and a half months old, he was sleeping through the night… and so was I. It turns out that even when Norton is sleeping peacefully, he makes noises. A few times, we stayed in hotel rooms that were standard rooms… so he slept in the same room with us in his pack n’ play. It turns out that the sounds he makes when he sleeps means that I don’t sleep. So when we travel, we rent one bedroom suites so that he can sleep in the living room and I can sleep peacefully in the bedroom. Everyone wins. I get that some people sleep better when baby is nearby, or that co-sleeping can be helpful for establishing breastfeeding. Whatever works for you. Me? I sleep best when I’m not hearing the twitches of a little boy. 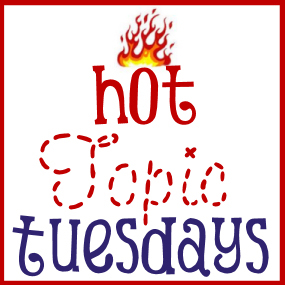 Share your opinion in the comments section or link back to us with your own Hot Topic Tuesday blog post! Next Tuesday’s topic: Child-free restaurants – would you eat somewhere that your child wasn’t welcome? We did all three with both M and K. I bed shared with K more than I did with M, because hubs and I agreed it would be best, and he would sleep on the couch for a few weeks (he is a heavy sleeper). It saved my sanity (literally). I was at higher risk of ppd because I had it when M was born, so we tweaked what we did with M, and made a new routine that worked for us with K. She started in the cradle in our bedroom each night, and after the second nighttime feeding, would come to bed with me. By a couple of months, though, she was in her crib in her room, and hubs was back in our bed. It worked for us, although I took a ton of criticism from people, especially my mom. She kept telling me I was going to smother the baby – I just reminded her of what her mother said when I coslept with M – that my mom slept with her mom when she was a baby as did all of her siblings, and they all survived. Note: I never took any medication or drank any alcohol that might affect my sleep pattern. I also made sure to get enough sleep that I wasn’t so exhausted that I would sleep too deeply. I kept the ceiling fan on at all times. I also removed blankets, and all but my one pillow, all to help my baby sleep safer. I am with you. I tried having my then newborn sleep in the bassinet next to my bed. Who knew babies were so noisy! I did not sleep at all with her in the room, but I later realized that I had PPD and I don’t think that helped with my sleep issues. It lasted about 3 weeks and she was in the crib. I think that what ever works for each family is best. I can see the beauty of co-sleeping when breastfeeding. I am a light sleeper too. Thank goodness for ear plugs! I will be able to hear the baby cry but not hear every little breath, wiggle, and whimper. Haven’t had my little one yet, but I’m a bit scared of co-sleeping to be honest, so will be having LO in a cot in our room for the first few weeks then move her to her own room by the end of month 1… At least that’s the plan for now! All that might change when she arrives!